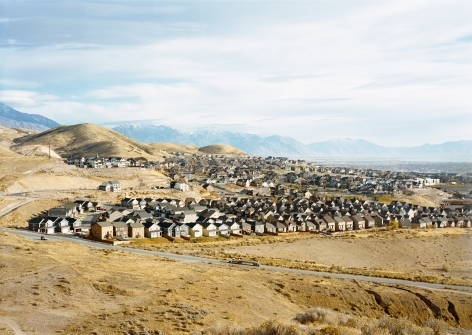 In 2016, Sambunaris curated an exhibition entitled Historical Echoes at Brigham Young University in Provo, Utah, for which she selected the work of a number of early landscape photographers, including William Henry Jackson, Charles Roscoe Savage and George Edward Anderson who helped establish a powerful iconography of the seemingly uninhabited West. Displaying their photographs and the archival material from their expeditions alongside her own work enabled Sambunaris to produce new insights into traditional iconography and expose a re-visioned landscape having to do with the allure of those seemingly impenetrable landscapes which are no less powerful today than over 150 years ago. 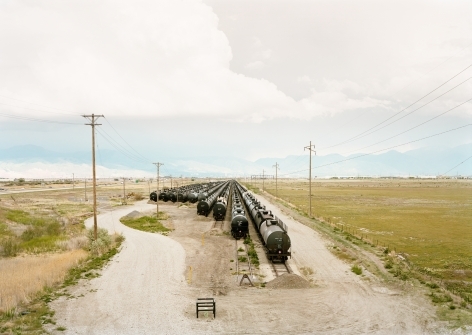 The seven large-scale works that comprise Land Mark were created over the course of two years, from 2016 – 2018, mostly in Utah. 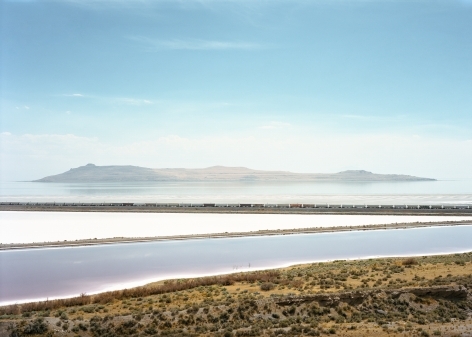 Sambunaris’s subjects include a train crossing the Great Salt Lake, a new housing development, and a 17-mile coal conveyor belt. Consistent photographic methods, including straight-on framing, precise focus, and uniform lighting, offer a slightly dizzying effect for the viewer, as their attention is not directed toward any one part of the image. 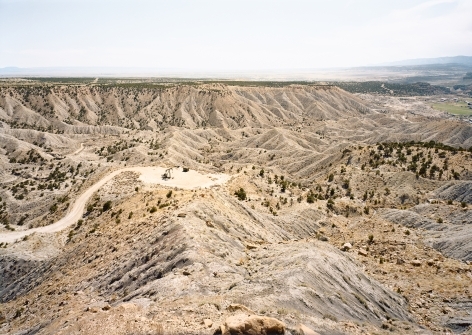 In Pump-jack, Draper UT, for example, it may take some time to absorb the vast, angular terrain, and only secondarily might the viewer’s attention be drawn to the pump in question. There is a sense of the deliberate slowing down inherent in Sambunaris’s analogue process – integral to the equipment she uses. Like the photographer herself, the viewer is enticed to look more closely and to take enough time to consider what they are looking at. 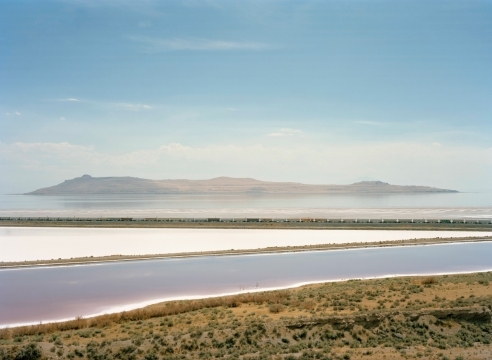 Victoria Sambunaris was born in Lancaster, Pennsylvania in 1964, and currently lives and works in New York. She received a BA from Mount Vernon College in 1986 and an MFA from Yale University School of Art in 1999, where she has since held various teaching positions. Her work has been widely exhibited in museums and galleries throughout the United States including National Gallery of Art, Washington, DC; Museum of Modern Art, New York; San Francisco Museum of Modern Art; Albright-Knox Art Gallery, Buffalo; Museum of Contemporary Photography, Chicago; Contemporary Arts Museum Houston; and New Mexico Museum of Art, Santa Fe. Her work can be seen in numerous collections throughout the United States, including those of the Albright-Knox Art Gallery, Buffalo; Lannan Foundation, Santa Fe; Museum of Fine Arts, Houston; The Museum of Modern Art, New York; the National Gallery of Art, Washington, DC; San Francisco Museum of Modern Art; and Whitney Museum of American Art, New York. 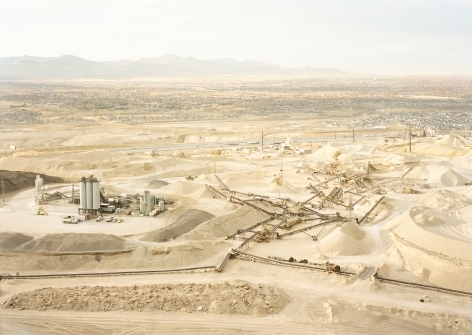 Sambunaris has received numerous awards, including the Charles Redd Fellowship Award in Western American History, Brigham Young University (2015); Aaron Siskind Foundation Individual Photographer’s Fellowship (2010); and the Anonymous Was a Woman Award (2010). 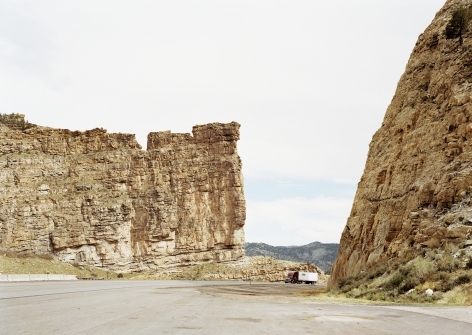 A monograph of her work, Taxonomy of a Landscape: Victoria Sambunaris, was published by Radius Books in 2013.